The ETAG members subdivided into three workgroups. Each workgroup explored current practice worldwide, reviewed literature and evidence, invited opinion, drew on their own very considerable experience and wisdom, and offered suggested ways forward. Together, we have decidedly not produced a plea for massive change in legislation, or for the substantial new funding of just one or two initiatives. It is more complex than that. There are very many agencies involved in building education through schools, colleges, universities and elsewhere. From Ofsted to parent governors we have produced a clear call for action, not for one or two “silver bullets” by one or two groups, but for a subtle recipe of significant change, involving everyone. 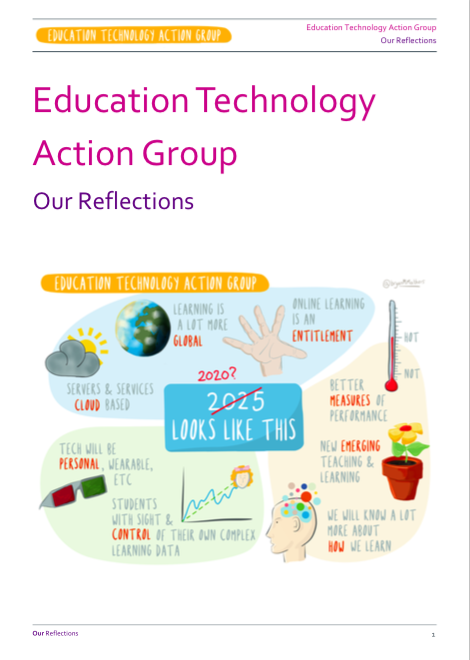 None of the ingredients within the ETAG reflections would be described as difficult – but it certainly is complex and everyone, every institution, every organisation, needs to play their part in moving forward if England is to achieve the pace and ambition needed. A clear story throughout is that simply adding technology to existing practice adds expense and misses the point of what might, and should, be achieved. A worksheet on a tablet is still a worksheet, but more expensively so. An undergraduate timed essay, but typed, still misses the point of the new intellectual tasks that emerge through connected learning. The hardest thing about moving forward is deciding what to leave behind. However, there is a clear imperative here: to move forward and to move forward from complacency. For many institutions the sense that ‘we are doing OK, you should see the place down the road though”, or from sectors “universities are ahead of the game, it’s schools we worry about”, or from some governors “we’ve done innovation, now we are focussed on consolidation” and so on. The pace of change, of work, of society, of technology itself, of globalisation, of the growth in competitors, of our transformed cognitive and pedagogic understanding of what makes astonishing learning, all combine to suggest that complacency will bring catastrophic atrophy. We are not saying prescriptively “do this precise thing”, but we are saying loudly “do some things” and below is our reflection, and justification, for what those things might include. Time and time again we have found the learners’ voice to offer wise inputs, thoughtful reflections and very little complacency indeed. For everyone reading this, organisations, institutions, individuals, we are also saying that working with, rather than simply for, learners is a clear pathway forwards. We really are all in this together. In many ways, the process of collaboration we embraced – using shared documents on Google Drive, mixing quite rare face to face contact with a continuous connected distributed conversation, welcoming input through social media as well as informal chats in coffee houses, producing an ongoing website rather than a printed document, running teams within a model of a very, very flat hierarchy… All this is indicative of an existing working world not well served by much current educational practice. We have been subjected to hugely reaffirming levels of goodwill and support, from ministers and officers through to students themselves. We are aware that there will be gainsayers too; education suffers from more than enough of them, and we are aware that for some this is all underambitious. We thank, and apologise, where appropriate. Fundamentally, we concluded that the use of digital technology in education is not optional. Competence with digital technology to find information, to create, to critique and share knowledge is an essential contemporary skill set. It belongs at the heart of education. Learners should receive recognition for their level of mastery; teachers and lecturers should too. Additionally, digital technology adds to the pedagogic repertoire available to support learners and learning. To make informed decisions about what uses of digital technologies might make learning better everyone, from teachers and students to policymakers, need to properly understand the portfolio of possibilities on offer. That might include informed decisions to not use digital technology of course. Digital technology can and should bring joy and engagement too: a delight in stellar progress, the exhilaration of unexpected challenges, the reaffirmation of a global audience. It is not unreasonable to expect education to change to meet the new needs of this changing world and in turn to be changed by the opportunities presented by digital learning technologies. A new world to be prepared for, with new ways of preparing. Some things will need to move over, to be dropped, to change and to vary to allow all this to happen. Everyone needs to play their part in enabling this progress.